"Well, Clemmy,'" said Britain, "how are you by this time, and what's the news?" "There'll be another job for Snitchey and Craggs, I suppose," he observed, puffing slowly at his pipe. "More witnessing for you and me, perhaps, Clemmy!" "Lor!" replied his fair companion, with her favourite twist of her favourite joints. "I wish it was me, Britain!" "A-going to be married," said Clemency. Benjamin took his pipe out of his mouth and laughed heartily. "Yes! you're a likely subject for that!" he said. "Poor Clem!" Clemency for her part laughed as heartily as he, and seemed as much amused by the idea. "Yes," she assented, "I'm a likely subject for that; an't I?" "You'll never be married, you know," said Mr. Britain, resuming his pipe. "Don't you think I ever shall though?" said Clemency, in perfect good faith. Mr. Britain shook his head. "Not a chance of it!" Although Furniss may well not have been aware of the original lead artist's own concern about how he could coordinate his conception of the comic woman of the melodrama, Clemency Newcome, with that embodied in the more elegant servant provided John Forster, manager of the enterprise, by Daniel Maclise, Harry Furniss elected to follow Dickens's description of the gangly, awkward servant rather than the models afforded him by previous illustrators, while retaining a phlegmatic Benjamin Britain. Furniss probably recalled the picture of the "proposal scene" in the Illustrated London News of Mr. and Mrs. Keeley playing these parts in the Albert Smith (and Dickens sanctioned) adaptation in the 26 December 1846 number; certainly, his composition bears considerable resemblance to "Scene from The Battle of Life, at London's Lyceum Theatre: Clemency, Mrs. Keeley; Britain, Mr. Keeley" (page 413). The figures, although reversed in Furniss's version, have identical postures, facial features, and costumes — even Clemency's easy-chair in Furniss's illustration seems to be based directly on the one depicted in the weekly newspaper, which in turn was a direct translation of the piece of furniture used by the Keeleys for their stage set, endorsed as authentic by their unofficial stage manager, Charles Dickens himself.Although Benjamin is prominent in Leech's "The Parting Breakfast" in that he stands at the foot of the table, wielding a carving knife and fork as he addresses Snitchey and Craggs, Clemency appears in a supporting role in that Leech illustration (only one of three for this fourth Christmas Book), as well as in Richard Doyle's "Part the Second" and Daniel Maclise's "The Secret Interview". 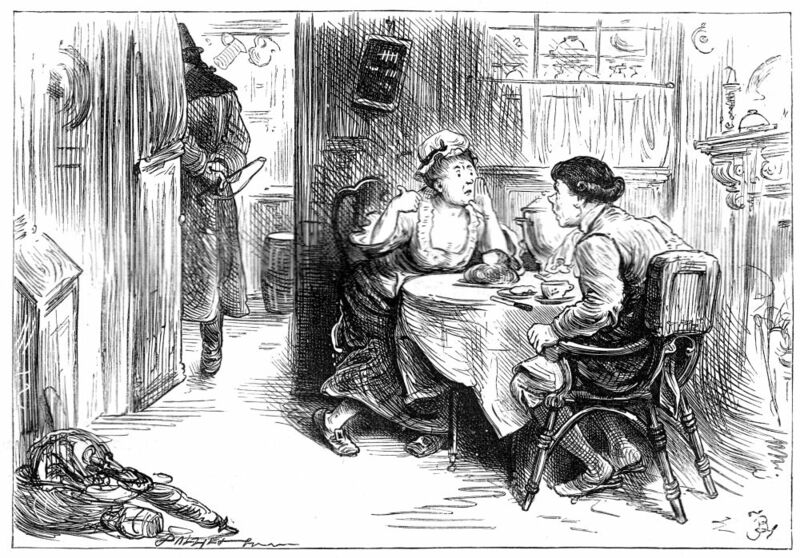 The smiling, youthful Clemency of the newspaper depiction of Mary Anne Keeley in the role is the basis for Harry Furniss's cheerful middle-aged woman, but both are in total contrast to the serious, elderly companion of Fred Barnard's "'What is the matter?' he exclaimed. 'I don't know. I — I am afraid to think. Go back. Hark! '", so that the modern reader must applaud Furniss's decision to abandon the figures of the Household Edition volumes in favour of the stage moment conveyed in the Illustrated London News. 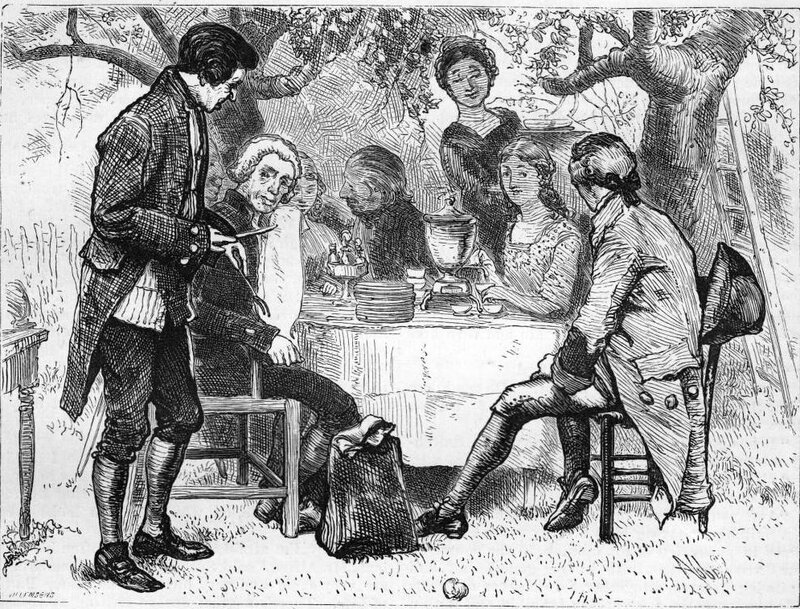 As has been noted, the Household Edition illustrators of the 1870s contributed little to Furniss's visualisation of Dickens's odd couple, who are stereotypical publicans in eighteenth-century garb in Abbey's realisation of the scene in which Michael Warden returns to the village after years abroad, and equally undistinguished servants in period costume in Barnard's version of "The Parting Breakfast." 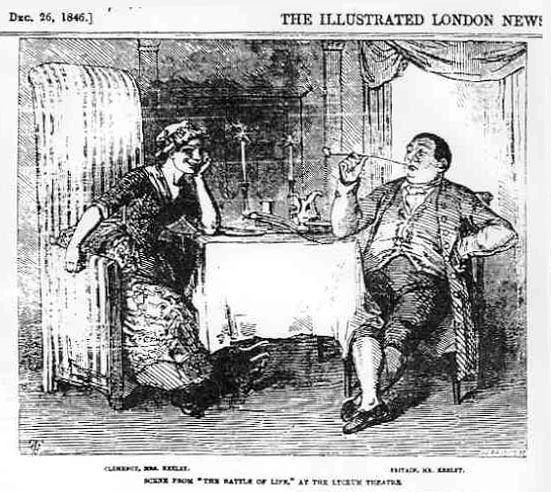 Thus, in choosing the proposal scene and in focussing on the comic servants as individuals rather than mere types in their own romantic plot, Furniss made the working-class couple who join the ranks of the middle class over the course of the story worthy of the reader's interest in the realisation of their own dreams. Furniss has realised their role as comic foils to the main plot, has broadened the cast of characters socially — and probably reflected something of the appeal of these comic figures to theatre audiences over sixty years. 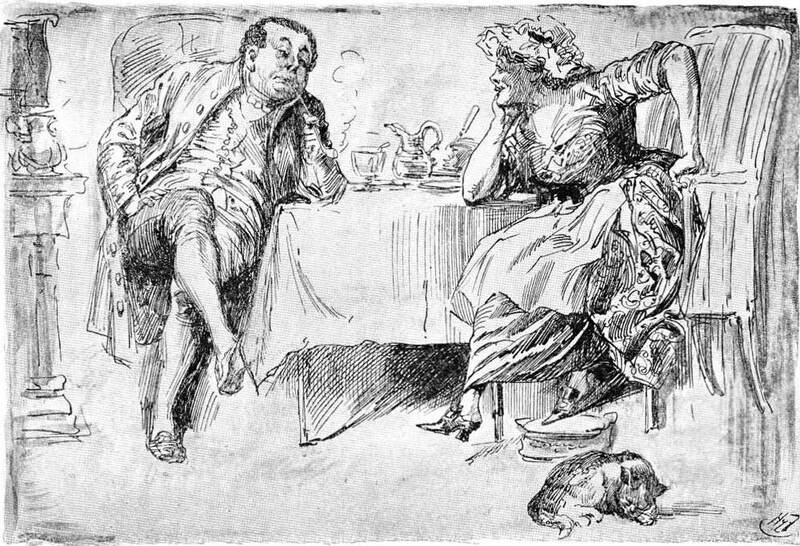 Although Furniss's impressionist style does not customarily include visual symbols, the circumstances of the discussion — the laden supper table — and in particular the cat sleeping at Clemency's feet, below her footstool, suggest her desire for domestic comfort. 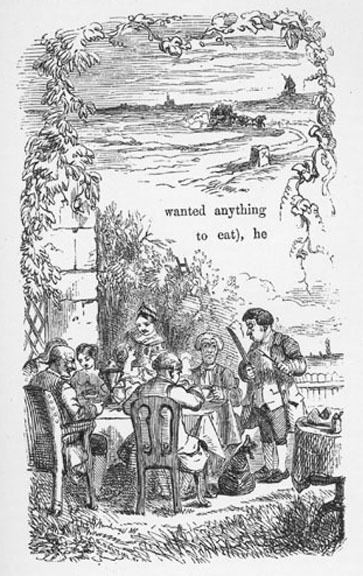 The gleaming pots and pans, in which in the text, Britain sees himself reflected would have imparted a nice "below stairs" touch, but Furniss again reveals himself not generally interested in providing such contextual details as the pot of beer at Britain's elbow. Cohen, Jane Rabb. "John Leech." Charles Dickens and His Original Illustrators. Columbus, Ohio: Ohio U. P., 1980. Pp. 141-151. Dickens, Charles. The Battle of Life. A Love Story. Il. John Leech, Daniel Maclise, Richard Doyle, and Clarkson Stanfield. London: Bradbury and Evans, 1846. Dickens, Charles. The Christmas Books. Il. Sol Eytinge, Jr. The Diamond Edition. 16 vols. Boston: Ticknor and Fields, 1867. "Scene from The Battle of Life, at the Lyceum Theatre: Clemency, Mrs. Keeley; Britain, Mr. Keeley." The Illustrated London News, 26 December 1846: page 413.